Wish them the fastest recover with a cuddly teddy bear, personalized just for them! This Sherman teddy bear helps brighten up their day and becomes a wonderful keepsake they'll always enjoy. 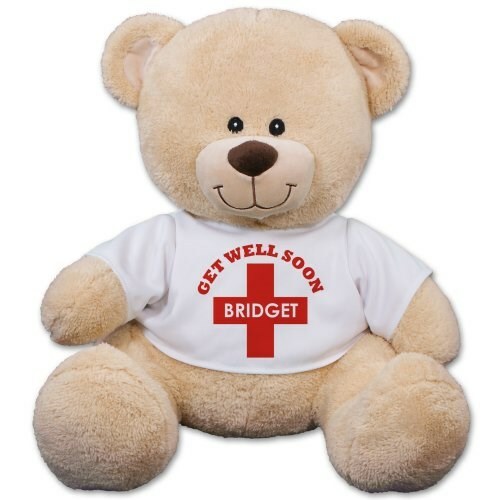 Our get well soon design is featured on our Sherman Teddy Bear. Sherman has an irresistible look on his face along with a wonderfully soft feel. He features contrasting tan fur on the inside of his ears and his snout. He measures about 11” and makes a wonderful gift for any occasion. Free Gift Wrapping and a Free Gift Card are included to create a thoughtful presentation.